The proposed budget also requests $40 million for the creation of a new “Safe Transportation of Energy Products Fund” within the Department of Transportation’s (DOT) Office of the Secretary, to be used by PHMSA, the Federal Railroad Administration and the Federal Motor Carrier Safety Administration to support prevention and response activities associated with safety issues relating to the transportation of crude oil. The budget request for DOT is here. On March 4, President Obama released the Administration’s proposed FY 2015 budget, which includes a request for a total of $260.5 million for the Pipeline and Hazardous Materials Safety Administration (PHMSA), a more than $50 million increase over FY 2014 levels. Almost $160 million and $52 million would be allocated to PHMSA’s pipeline safety and hazardous materials programs, respectively. The proposed increase for pipeline safety would allow for the hiring of new federal pipeline inspectors and would support numerous initiatives within PHMSA, including the agency’s pipeline data collection and mapping initiative. On February 25-26, PHMSA held joint meetings of its Gas and Liquid Pipeline Advisory Committees. The Committees covered a range of regulatory and policy issues. The Committees voted to adopt into PHMSA’s regulations a new version of an industry specification for polyethylene pipe (ASTM-D2513), but without a provision that would allow the use of “reworked” plastic in the manufacture of new pipe. PHMSA will take the Committees’ vote into consideration in a a rulemaking to update standards incorporated by reference into the pipeline safety regulations. The Committees received a briefing from PHMSA and industry on “midstream regulatory jurisdiction” related to natural gas liquids (NGL) processing and fractionation facilities. PHMSA and industry described confusion and unsettled policy issues associated with where jurisdictional lines are drawn at these facilities. The Committees have created a subcommittee to study the issue and report back to the full Committees at the next meeting. 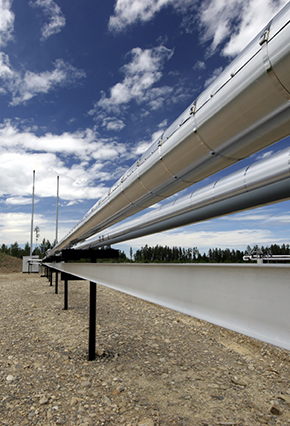 PHMSA provided an update on its study of whether to modify or eliminate the class location requirements for gas pipelines and, instead, apply integrity management principles. Committee members expressed a wide range of views (from support to caution) on the issue. The agency is still collecting information and will hold a public workshop on April 16 in Crystal City, Virginia. PHMSA indicates that its study will be complete in early summer 2014. Representatives of PHMSA, the states, industry and the public provided briefings on their respective priorities. Notably, the expansion and clarification of gas gathering regulations was a high priority for the states and the public. State representatives also sought further guidance and clarification from PHMSA on Maximum Allowable Operating Pressure (MAOP) verification and the Integrity Verification Process (IVP). Industry representatives urged PHMSA to issue its gas transmission and hazardous liquids proposed rules to avoid continued regulatory uncertainty. Industry representatives also urged PHMSA to issue its final Damage Prevention rule, and several speakers urged that the agency require the elimination of all exemptions from state one-call programs. PHMSA provided an update on its numerous rulemaking proceedings. Among the many rulemakings discussed, the agency indicated that the long-awaited hazardous liquid proposed rule, damage prevention final rule, excess flow valve proposed rule and other proceedings are now beyond PHMSA and under review at the DOT Secretary’s office or the Office of Management and Budget (OMB). Several other proceedings, including the gas transmission proposed rule, remain under development or review within PHMSA.PHMSA provided an update on Congressional mandates and recommendations from the National Transportation Safety Board, the DOT Office of Inspector General, and the U.S. Government Accountability Office. Notably, PHMSA reported that it has completed and is currently reviewing the report on gathering lines required by the 2011 amendments to the Pipeline Safety Act (PSA). PHMSA also indicated that it hopes to address all open mandates and recommendations before the next reauthorization of the PSA. PHMSA detailed its efforts to collect and properly interpret pipeline facility and incident-related data and provide it to the public. PHMSA is working with stakeholders on the development of pipeline performance measures to assess both operator and regulator performance. Committee meeting presentations and a transcript of the proceedings are available here. DOT Seeks Comment on Its Regulatory Review Process. On February 27, DOT issued a notice and request for public comments on its continued retrospective review of existing regulations to determine if they are outmoded, ineffective, insufficient, or excessively burdensome. DOT has identified 79 existing rules for which it has already undertaken or proposed actions that promise significant financial or time burden resource savings, and 56 rules with potential savings. DOT is initiating the second round of its retrospective review and seeks public comment on how it should be managed. DOT requests comments by March 31. Application Deadline for TAG Funds Is March 17. PHMSA is requesting applications from local communities and groups to obtain funding for technical assistance on pipeline safety issues affecting local communities or to help promote public participation in official proceedings pertaining to pipeline safety issues. More information is here. Status of PHMSA Rulemakings. The table below reflects the most current publicly available information on the status of PHMSA rulemakings as reported in the DOT’s February 2014 Significant Rulemaking Report. Additional information from the Office of Management and Budget’s (OMB) Office of Information and Regulatory Affairs (OIRA) is here. On February 20, the New York Public Service Commission (NYPSC) issued an Order Requiring Risk Assessments and Remediation of New York Gas Facilities requiring that gas utilities subject to its jurisdiction (1) perform special assessments of their facilities to determine the extent to which their gas facilities may have been compromised by third-party excavations; (2) conduct more robust public outreach to ensure that customers and others are aware of the importance of reporting natural gas odors, and (3) improve outreach and training provided to local governments and others to prevent third party excavations from harming existing gas facilities.